How green is your alley? You may have biked through an alley to avoid traffic, or taken a shortcut through an alley while walking. What did you see? Blighted passageways to be avoided at all costs? Renovated public throughways where people gather regularly to spruce up their common ground? The story of a green alley is all about neighborhood coalitions working together to take back their alleys. In North Park and City Heights and along the El Cajon Boulevard corridor, business people like Ethan van Thillo, executive director of the Media Arts Center located at 2921 El Cajon Blvd., bring together high school students, neighbors and homeowners to participate in “Take Back the Alley” events. Since May 2012, volunteers have met to clean up alleys, haul away litter, sweep up cigarette butts and remove broken glass. After those initial work parties, volunteers remove graffiti on alley walls and prepare them for painting of colorful murals. Neighborhood participation can transform ugly alleys into community spaces where small businesses can link the property between their shops and adjacent alleys. But why work so hard, without pay, just to clean alleys? 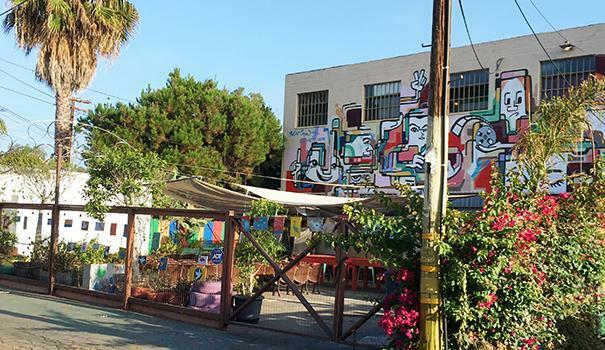 Neglected alleys threaten a community’s sense of security, said Maritza Maksimow, safety program manager for the City Heights Community Development Corporation (CDC). “Poorly lit alleys become dumping grounds for all kinds of junk, and with obscured visibility they often allow for chronic illegal activities and encampments,” she said. 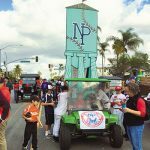 Claudia Balthazar Ciarmoli, program manager for Social Advocates for Youth (SAY San Diego), said that taking back alleys promotes a sense of community among people of all ages and helps prevent crime. Ciarmoli runs programs to safeguard young people whose health could be at risk within inner city neighborhoods. She works with the City Heights Clean and Safe Coalition, and some months ago put together an assessment team to evaluate local alleys. Determined to improve sanitation and safety of stores, streets and alleys — the goals stated in City Heights’ Alley Improvement Project flyer — Ciarmoli engages youth and adult volunteers to identify community assets, areas of concern, team strategies and stakeholders in the well-being of the neighborhood. Assessment studies, conducted under Ciarmoli’s guidance, show that when a commercial building owner does not comply with city health codes, unsanitary conditions in the alley behind the building soon get out of control, leading to “homeless encampments, drug dealing, theft and graffiti on the walls of adjacent businesses and homes,” according to the flyer. 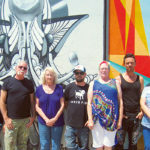 In a mixed-zone area of eastern Hillcrest,neighborhood watch team members Paul Smith, Ricardo Macias, Mary Lunetta, Noelle Maestas and other volunteers during the spring made their own assessments related to an unsupervised vacant building along University Avenue. Proposed renovations to the building have lagged, and gradually the back parking lot and dumpster area of the property deteriorated. A neighboring shop owner, along with adjacent businesses to the east and resident owners to the south, complained to the police about sanitation problems and crime violations. When citizens’ phone calls to City Hall didn’t seem to get results, residents filed complaints via the internet at sandiego.gov. A link to the city’s code enforcement form allows residents to report violations in alleys adjacent to private property, and the website states that action will be taken within 30 days. But when that didn’t happen, the neighborhood watch coordinator went to the code enforcement office and filed another report, and the City Attorney’s Office was notified. When noticeable code violations go unenforced, neighborhood groups like the City Heights Clean & Safe Coalition step in to visit blighted areas and write assessments of wrongdoing. An even more proactive direct-action approach to solving code violations in alleys began in 2013. Beryl Forman, now the marketing and mobility coordinator of the El Cajon Boulevard Business Improvement Association (BIA), got together with Avital Alboody, former economic development manager with the City Heights CDC. Together the two women set up a “can do” program designed to change alley environments from bad to good. They brought together property owners, business owners, employees, tenants, children, artists, city staff, clergy, non-government organizations and police officers to talk about grass-roots solutions to health and safety issues in alleys. Forman and Alboody also worked closely with Media Arts Center’s van Thillo, founder of the Take Back the Alley program. This year, when Alboody moved to Los Angeles to continue her schooling in urban planning, Maksimow took over as community safety program manager for the City Heights CDC. Does enhancing public space really prevent crime? “Alley improvement programs have been known to reduce crime in surrounding neighborhoods,” Maksimow said. The Digital Gym learning center, part of the Media Arts Center, features an outdoor media school behind the main building, in an area where the property line abuts an alley. Because the right of way is shared in mixed-use areas (commercial/residential), the alley creates a sense of community where neighbors share common ground. A broken-down parking lot used to be where the Digital Gym school is now. Van Thillo, in a San Diego Union Tribune article published Aug. 24, 2014, described the condition of the back parking lot when he bought the property. It was, he said, “a dilapidated, vacant place, people living inside: It wasn’t a pretty area.” Van Thillo applied for funds from local foundations and invited people to volunteer to renovate the lot. These days, if you walk the alley behind the Media Arts Center, which is parallel to El Cajon Boulevard and on the west side of 30th Street, you’ll see an outdoor classroom and an open yard full of potted plants, colorful pictures of cranes, hearts and doves on pieces of wood, and a raised garden off to one side. You’ll see students pointing their cameras in various directions as they learn about angle shots and point of view. 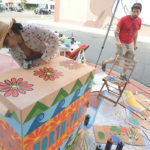 By “taking back the alley,” using plants, artwork and a colorfully designed mural, volunteers young and old “helped transform this neighborhood,” van Thillo said. 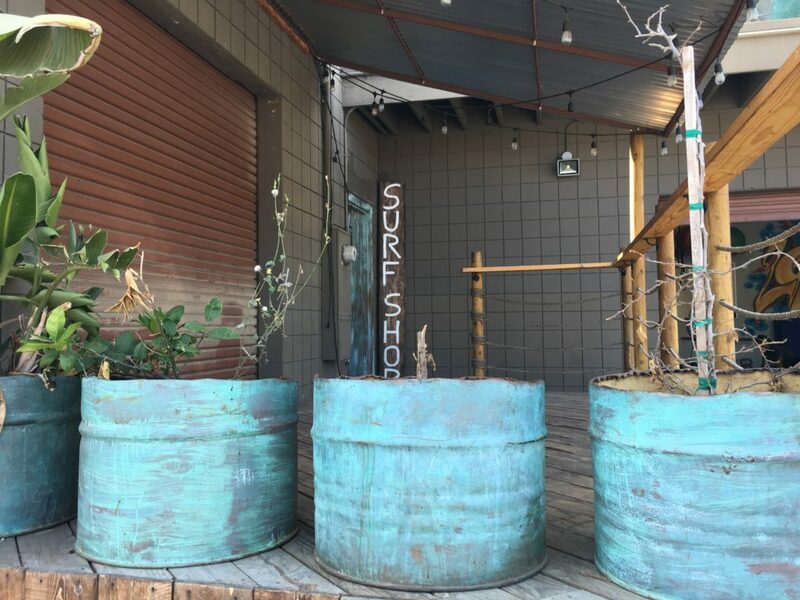 Through the El Cajon Boulevard BIA, Forman has continued to work with building owners, homeowners and community outreach organizers from North Park, in a widespread effort to encourage start-up business owners to transform unimproved alleys and create attractive spaces where people can gather. On the other side of 30th Street from the Media Arts Center alley, transformation continues outside Shaper Studios SD, now in its third year of business in what it describes as “the world’s first DIY surfboard and retail surf shop.” Shaper Studio’s alley is a continuation of the alley behind the Digital Gym. General manager Kory Nutter is supervising the work of a member/client who just finished shaping the first stage of what will eventually become his surfboard. Nutter and studio instructors work together with men and women in their 20s and 30s who want to make their own surfboards. “We don’t sell surfboards, we teach people to make them,” Nutter said. The deck outside their shop interfaces with an alley directly across from another parking lot, which serves businesses on El Cajon Boulevard east of 30th Street. On Friday nights, Shaper Studio surfboard makers come back with their friends to hear local musicians jam at the studio. A deck facing the alley outside the studio provides additional room for patrons to have a drink, converse and listen to music. At KOR strength training center next door to Shaper Studio, Michelle Giusti consults with men and women about food choices. Giusti is the on-site nutritionist who works with KOR’s founders Kristen Karhio and Dan Bettcher, who were unavailable for comment. With so much talk about GMO-modified food, gluten-free choices and lactose intolerance, Giusti said it’s important for people to know their personal dietary requirements. “I teach more about how you can figure out your personal preferences for yourself, what’s good for you as an individual,” she said. She’s a morning person, and said the ambience around KOR, where spinner exercise bikes stand ready for use next to the alley, suits her disposition. Inside, personal trainers work out with a diverse group of men and women devoted to physical fitness. Weight lifting, stretching and even throwing a ball help develop balance, muscle tone and the ability to use your core. Always looking for a way to reach out to the community, Forman encourages talented muralists to paint blank walls. 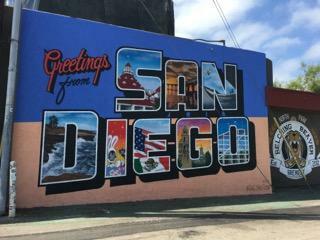 She lucked out when a couple of muralists touring the United States came to the North Park alley and painted a “Greetings from San Diego” mural. Forman also meets with city workers who want to help design plans for public events in alleys. Not too long ago, city planners believed that “under existing city codes, actually nothing can be done in alleys, because they’re places where dumpsters are … and garbage … and traffic,” she said. But changes have recently occurred in city policy, based on efforts to rewrite outdated permits. Creative negotiation has to a point opened up civic partnerships, bringing flexibility to the process of issuing permits, Forman said. Elizabeth Studebaker, the city’s Economic Development liaison, works with nonprofits like the El Cajon Boulevard BIA to develop permits for space-making opportunities in the Uptown and Mid-City communities. A few weeks ago at a City Hall stakeholder meeting, representatives from the city’s Commission for Arts and Culture, Streets Division, Development Services, Planning Department and Economic Development met to go over space-making in general, and alley renovation in particular. Forman and Studebaker also meet with nonprofit community organizations that have been researching processes adopted in other cities in Southern California and the nation, and they said the mayor’s staff is involved. Aaron Paley, president and co-founder of Community Arts Resources in Los Angeles, sees a successful public space as “a lowering of boundaries between people” and mentions a potential for reviving Pershing Square in downtown LA as a place where community gatherings could happen morning, noon and night. Read more at kcrw.co/2bBN6YT. In Seattle, Canton Alley in the International District and Nord Alley and Pioneer Passage in Pioneer Square will be the first three spaces to receive updates. Read more at bit.ly/1L3lh4V. When questioned about San Diego’s code permitting process, Adriana Martinez, a staff member for District 3 Councilmember Todd Gloria, explained that city code for permit decisions must be based on whether a project takes place on public or private property. These two internet links open up City Council code rules on improvements to existing alleys: bit.ly/2b77f4T and bit.ly/2bqsaSN. “City departments are trying to figure out a way, that works for all involved, to simplify permitting in order to serve community organizations that want to do something to enhance their neighborhoods,” Studebaker said. Is there anything city planners can do to decrease the length of time it takes to get a permit, the cost of a permit, or the technical information that’s required? Forman notes that North Park, City Heights and El Cajon Boulevard BIAs want to move beyond the notion that nothing can be done about alleys. 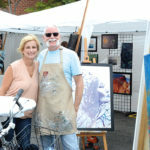 “An alley is actually a public space where you don’t get much traffic volume, so it makes for a great outlet to enhance an area,” Forman said. Hillcrest BIA president Ben Nicholls said via an email that his group hadn’t yet joined the movement. “While we are engaging in place-making, we don’t have any plans to renovate our alleyways,” Nicholls said. Forman said some city planners are ready to help design plans for public events in alleys, based on community feedback and requests from neighborhood organizers. Chris Ward, incoming councilmember for District 3, expressed support for the movement. Public right of way, public vs. private property, city/property owner improvement of abutting pavement — all of these issues present challenges faced by private citizens and city employees who plan, develop and design ways to bring San Diego up to speed with Portland, Seattle, Los Angeles and San Francisco, among other places. These metropolises are moving forward to develop space-making potential, and are in the business of bringing city dwellers together in urban villages. Go for a walk, ride a bike or drive through San Diego’s crowded streets, and you’ll notice lots of road construction. The reality of population density brings with it the realization that adding more automobiles to an already congested urban grid is no longer an option. Will green alleys be part of the solution? Maybe so. —Kathleen Hughart is a freelance writer and can be reached at hughart.kathleen@gmail.com. The alley article is so interesting and full of resources. It is a textbook for renovating our public right-of-ways. I hope there will be a series of articles that will follow how alleys evolve into community assets. There is not much land left in Uptown, so now it is time to incorporate whatever public space is available into pleasant places. My alley behind my house is a constant trash dump .The owner of the house behind me rents to many low income people who every time they move throw there stuff that they cant carry into the alley.Right now as of Dec.07 2018 the alley behing my house is full of trash stacked up.from my neighbors house.This person needs to be dealt with.He needs to put a stop to this dumping in the alley Total disrespect for neighbors.